Generations at Rock Island supports the fight against Alzheimer’s and dementia. 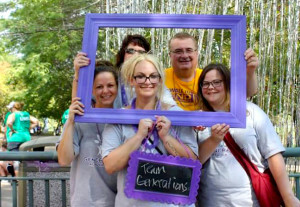 Every year they assemble a team and get to work on brainstorming ideas about fundraising efforts to make their participation in the Walk to End Alzheimer’s a success! Generations at Rock Island is one of the hubs of Generations Healthcare Network’s Alzheimer and dementia wards. Though all facilities offer residents care for these illnesses, they have a special unit and program that helps individuals to maintain optimal level of independence and quality of life in a secured and safe environment. On September 16th, the Generations at Rock Island team participated in The Walk to End Alzheimer’s at the iWireless Center in Moline, IL. They had a vendor table and were the exclusive sponsors of the photo station- a new and exciting attraction this year! Attendees, staff, friends and family could not have asked for a better day. The crowds were big and buzzing with excitement. Generations at Rock Island is passionate about this cause and had a great time participating in these events. The event is the world’s largest event to raise awareness and funds for Alzheimer’s care, support and research. Generations at Rock Island cannot wait for next year!